“Grete Marks” display at the Jewish Museum Berlin. Photo by the author. As I moved through the stages of putting together the Milwaukee Art Museum’s Grete Marks: When Modern Was Degenerate exhibition (on view September 6, 2012 – January 1, 2013), I began by researching the designer through secondary literature and compiled a list of 417 Grete Marks ceramics and watercolors in institutional collections. Those tasks I could do mostly from my office in Milwaukee, thanks to great library services and generous colleagues at other institutions. 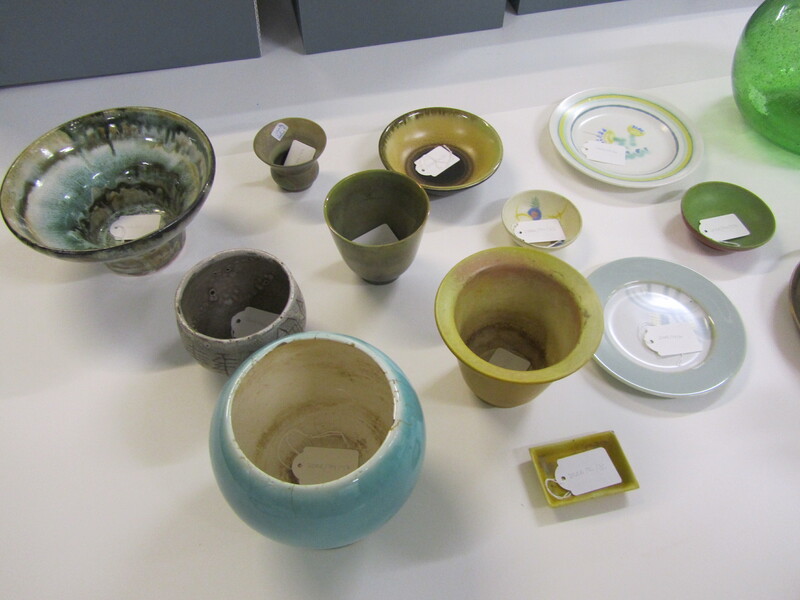 However, to build relationships with curators for borrowing artwork, to meet with Grete Marks’ daughter Frances Marks, and to personally examine objects so that I could make informed decisions about which of the ceramic vessels we might want to request for loan to our exhibition, I needed to take a research trip to London and Berlin. While researching in England, I made visits to “store” (Brit speak for “storage”) to see artworks at the Victoria & Albert Museum, The British Museum, and the National Museum in Wales. Those institutions have in their collections gifts from the artist herself, as well as from her husband, Harold Marks, and her daughter, Dr. Frances Marks (as do the Potteries Museum and the Museum at Wales’ Prifysgol Aberystwyth University, which I did not visit). 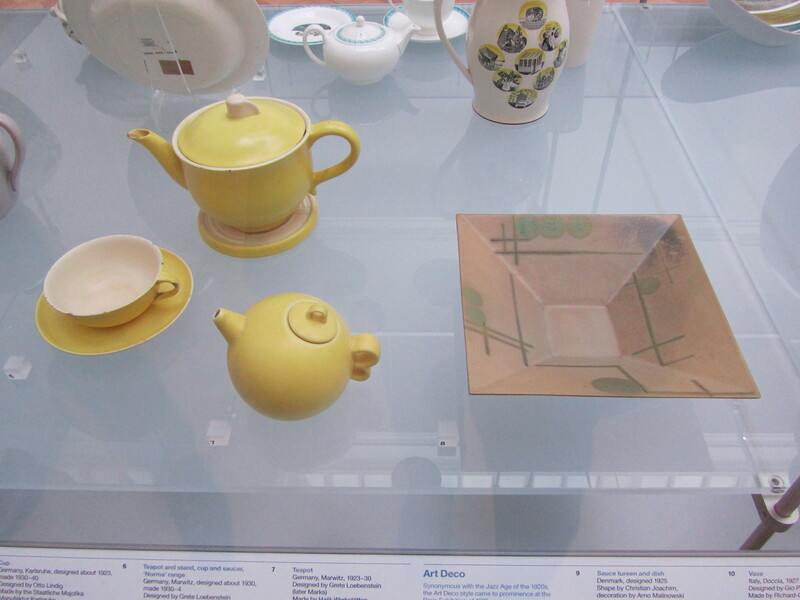 Grete Marks ceramics on view at the Victoria & Albert Museum in London. Photo by the author. Visiting these collections allowed me to see how other institutions display her work, as you can see in the two photos above, showing displays at the V&A Museum and in Berlin at the Jewish Museum. After explaining my research and making appointments with colleagues at these museums, I was also given special access to closely review all parts of the objects. This allowed me to compare details, examine condition, and note details, including the factory marks such as those you can see in the image below. Below the white sticker (with the V&A’s accession number) on the bottom of that teapot is the blue factory mark for Grete’s “Hael Norma” collection, a line of more traditional ceramics she produced in 1932 to appeal to a wider audience, while the Haël Werkstätten factory struggled to remain economically viable during Germany’s faltering economy and increasing persecution of Jewish-owned businesses. 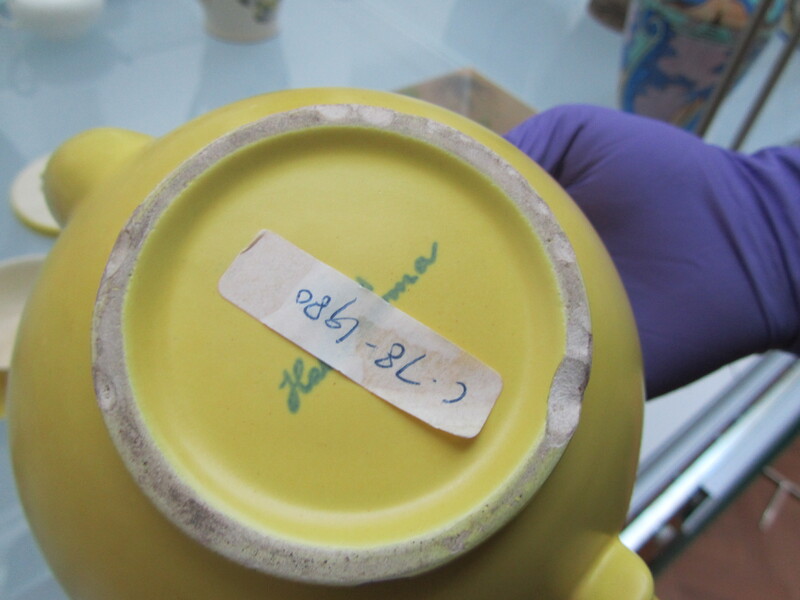 Examination of ceramics with a curator at the Victoria & Albert Museum. Photo by the author. In London, I visited Grete Marks’ watercolors, on consignment at the Abbott & Holder gallery, as well as a fantastic private collection of her ceramics in Brighton. Most excitingly, I was honored to meet with the artist’s daughter, Dr. Frances Marks, to explore her collection of her mother’s diverse artwork made over the full course of her lifetime, and to hear first-hand accounts from the designer’s family. I had a long conversation with Dr. Marks, which I recorded on a small digital recorder. I not only heard a factual account of her mother’s life, but also had opportunity to learn (from the family’s perspective) parts of the story that they felt were often overlooked. Dr. Marks also shared research material and family photos, like the newspaper clipping of her mother’s 1937 English exhibition shown below. 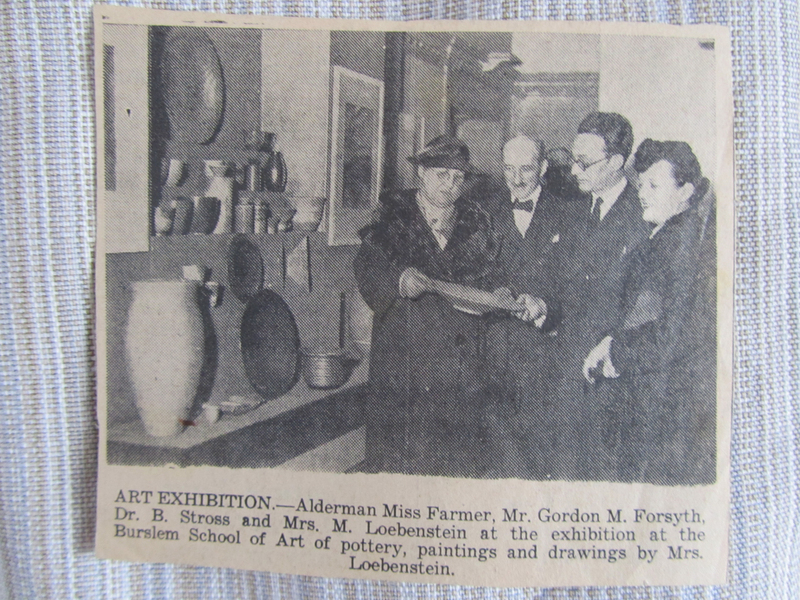 Research snapshot of a newspaper clipping from Grete Marks (then Margarete Loebenstein)’s exhibition at England’s Burslem School of Art, February 1937. Collection of Dr. Frances Marks. Photo by the author. 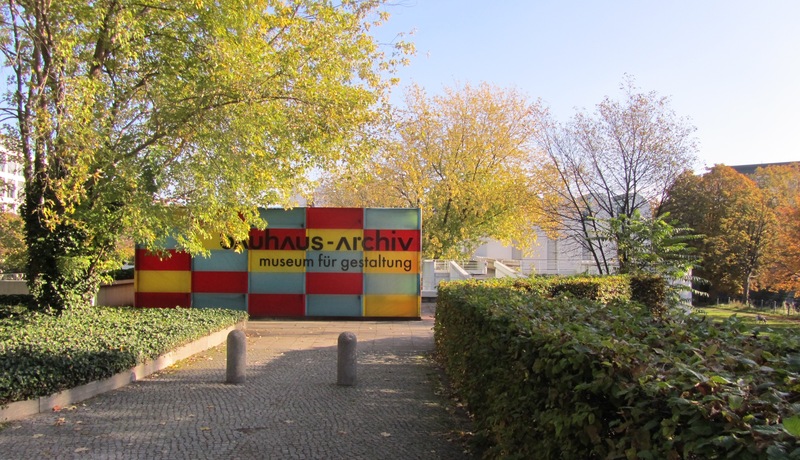 In Berlin, Germany, I had arrangements to visit storage and paper archives at the Jewish Museum Berlin, Bauhaus-Archiv, Bröhan-Museum, Keramik-Museum Berlin. This included more hands-on investigation of artwork, review of more watercolors and works on paper, additional secondary research articles, and (at the Jewish Museum Berlin), being able to review copies of Marks’ family restitution documents. The papers document the back and forth conversation between the family (and their lawyer) and German compensation offices regarding the forced sale of the Haël Werkstätten (in 1934), and range from the mid-1960s until financial restitution was granted in 1987. Snapshot overview of Grete Marks works in Berlin. Photo by the author. Approaching the Bauhaus-Archiv, Berlin. Photo by the author. I returned from my trip to England and Germany overwhelmed with Grete Marks material, but inspired to sort through all my images and notes to make the best presentation possible at the Milwaukee Art Museum. With limitations in budget and square footage, I had to make difficult decisions about which artworks to borrow, and therefore which parts of the story we could highlight. With the understandably high costs of art shipment and insurance, the exhibition budget did not allow us to borrow artworks from two “overseas” lenders. In the end, we have a loan agreement to borrow artwork from our colleagues at the V&A Museum, which means I was unable to ask for any of the stellar examples of her work in Berlin. 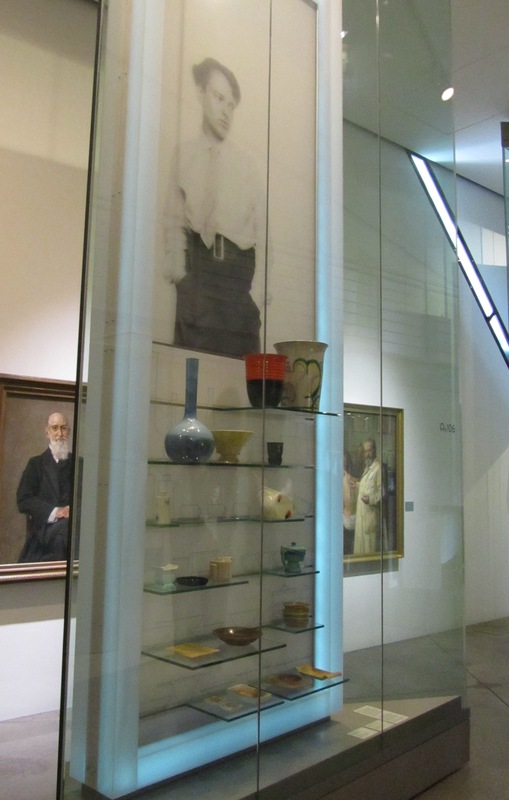 I selected the V&A materials because of a few key artworks they had in their collection, like the vibrant vase with asymmetrical orange handles, and works from Grete’s Hael Norma line. I couldn’t imagine putting together an exhibition without those works. With a basic plan in mind of what the exhibition could include, how much it would cost, and the details of the story as I personally wanted to tell it, the next job was to make the exhibition a reality at the Milwaukee Art Museum. I spoke to committees, marketers, educators, and donors making them appreciate the story as much as I did. This entry was posted in Art, Behind the Scenes, Curatorial, Exhibitions and tagged Behind the Scenes, Exhibition, Grete Marks, Travel. Bookmark the permalink.